In this post I am going to show you How to Install Xposed Framework on Android Oreo 8.0, 8.1 device step by step guide. This method tested on my Moto G4 Plus with Custom Android Oreo 8.1.1 ROM and this is work perfectly So you can install it without any problem but do it at your own risk I am not responsible for any damage. Note: TWRP recovery pre installed on your device. If you have moto g4 plus you can also check out How to Install TWRP Recovery 64bit on Moto g4 plus. 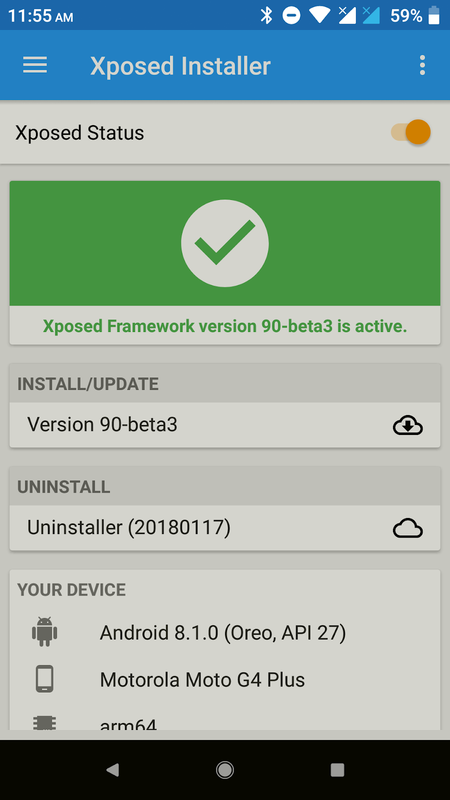 Download Xposed 3.15 Apk from link given below. Download Xposed Framework according to your device processor architecture from link given below. Check the processor of your Android device as Xposed Framework is available for Xposed framework available for different types of CPU’s. You can check the CPU of your smartphone by installing PU X: System & Hardware info application from Google Play Store. And find which architecture is your phone like Arm64, ARM or x86. For Oreo, SDK26 is Android 8.0 and SDK27 is Android 8.1. Congratulation, Now you can enjoy Xposed Module on your nougat device. You can also download Lucky Patcher apk for Nougat. If you find any problem in download link or in installing process. Please drop your comment below, we will reply as soon as possible.